Pick your size and get ready to strut your stuff! Choose from the smaller A5 or the large A4 Strut cards to grab the attention of your customers. Available on thick 450gsm Silk stock with a rigid strut board attached. Strut cards are even available with a laminated finish in gloss, matte, or soft touch. Strut cards are the perfect way to get noticed in smaller more intimate environments such as cafes, restaurants, and shops. Similar idea to table talkers; they are free standing A5 or A4 printed documents, ideal for displaying offers, menus, specials or any promotions that you currently want to display or draw attention to. 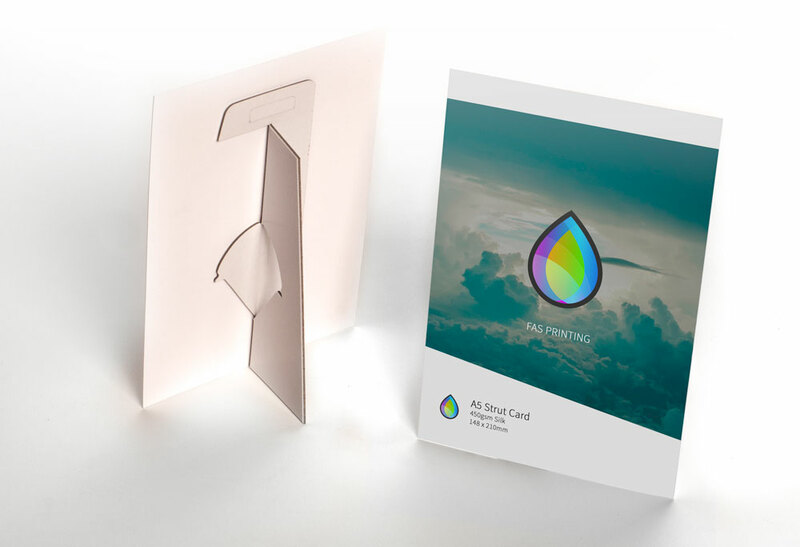 Our strut cards are printed in full colour on 450gsm silk card stock. We don’t print on anything thinner, as it doesn’t stand up to prolonged use as well as the thicker stock. You can have optional lamination at a small additional fee, available in gloss, soft touch or matt lamination. Lamination options: No Lamination, Matte, Gloss, Soft Touch. We use a combination of digital printing and litho printing methods to give you the best price we can. As a rule of thumb, print runs up to 500 are printed digitally while runs above 500 will be printed litho but this cannot be guaranteed.